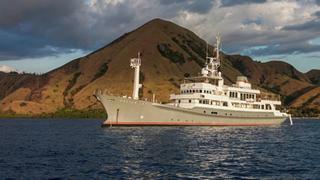 The 58 metre motor yacht Salila has been listed for sale by Burgess. Originally built in steel as a commercial vessel by Japanese yard Kanasashi and delivered in 1991, Salila was converted into a luxury expedition yacht in 2009/2012 under the direction of designer Tonny Sadha. Accommodation in a generous interior panelled in white oak is for 20 guests in 10 cabins comprising two master suites, four doubles and four twins. All guest cabins have en suite bathroom facilities while the crew quarters sleep up to 20 members of staff aboard this yacht for sale. With five split level decks Salila has endless relaxation areas including a large sun deck with a Jacuzzi spa tub and full wet bar plus numerous couches. The interior includes a large dining area, library, study and lounge. Refitted with full walk-around decks with an eye on the charter market, she offers a multitude of sunny and shaded al fresco spaces for entertaining and comfortable dining. A single 1,800hp Askaska diesel engine offers a cruising speed of 8 knots topping out at 11 knots and a cruising range of 10,000 nautical miles at 8 knots. Lying in Indonesia, Salila is asking $5,888,000.